Picnic At Marina: Happy Tuesday! We always have a mixed fillings about the V-Day. I am still confused why we even have to have it?! I prefer to love and be loved all 366 (this year) or 365 (normal year) days a year, so does my husband. But because it's celebrated everywhere, I decided to post some picture for everyone to enjoy and to let everyone know that we love them. Welcome to my V-Day table! Enjoy your day! What was your favorite on the menu? Please, come back for recipes. Delicious!What a Valentine treat. Well done! Wow, what a feast!! I loved all of it. 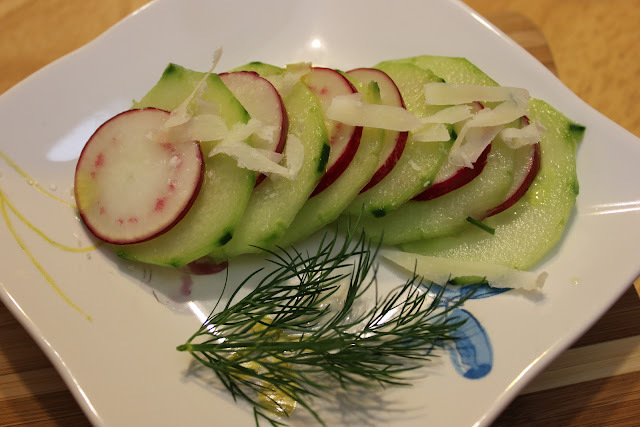 Hard to choose which ones were my favorite, but the Panna Cotta and the sliced cucumbers and radish look like recipes I need. Dear Milli, thank you very much for coming to my table. I am glad you liked it. 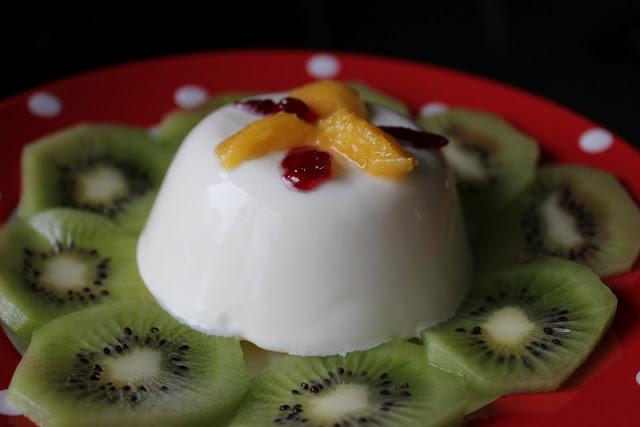 Panna Cotta recipe is coming soon, so, please, come back! Happy V-day! I would love to be at your Valentine table; Everything is right up my alley. You are right; we should celebrate every day. THank you Rita. Let celebration begin today! I agree with you feeling on Valentine's Day, I celebrate everyday to have someone so special in my life. Your pictures are incredible, the Panna Cotta is my fav!!! Thank you! One of your butterflies would be nice on the Panna Cotta glass, don't you think?! The potato pancakes bring back memories of my Dad. He loved them. His mother would fix them for him and he would spread applesauce on them. How sweet... 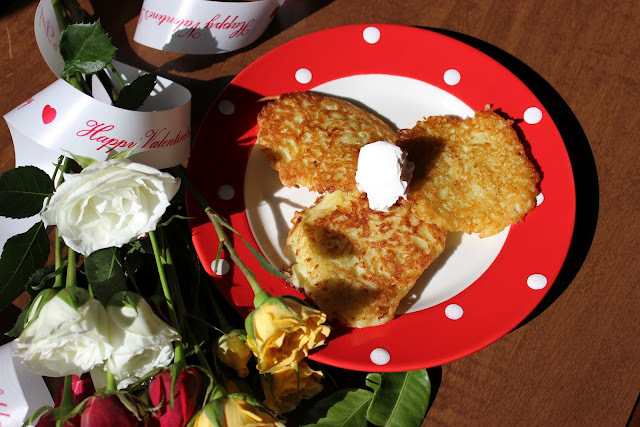 Although those are savory potato pancakes, I can see apple sauce on it too. Thanks for stopping by. I haven't seen you in a long time. Panna Cotta, definitely. But it needs a fruit coulis with it, like raspberry, or even rhubarb. Raspberry would be very nice Mark. I used what was available, though: kiwi, mango, and an raspberry preserve. Spinach muffins??? Yum. Everything looks beautiful. Thanks Heather. 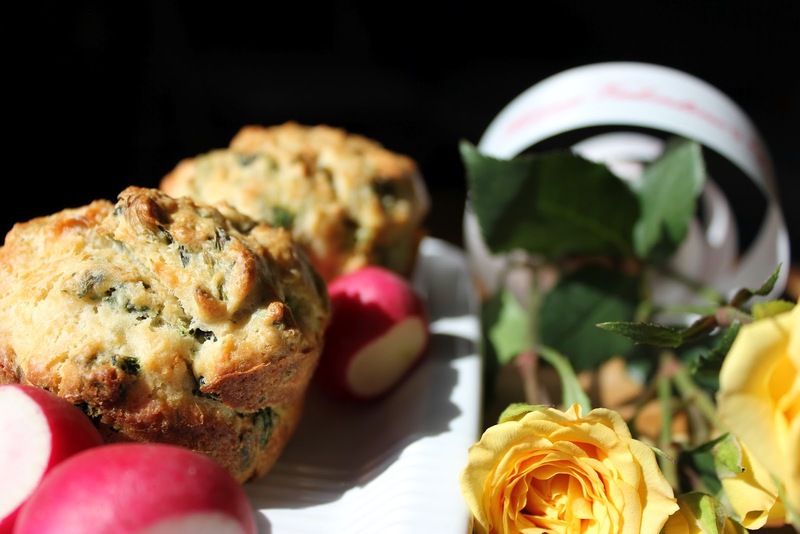 Yes, spinach and cheese muffins. Very easy to make. Happy Valentines Day! I'm with you - I'd rather have the kisses all year. Honey Bunny and I celebrate in a very non-traditional way....no cards or gifts. We like company and conversation! 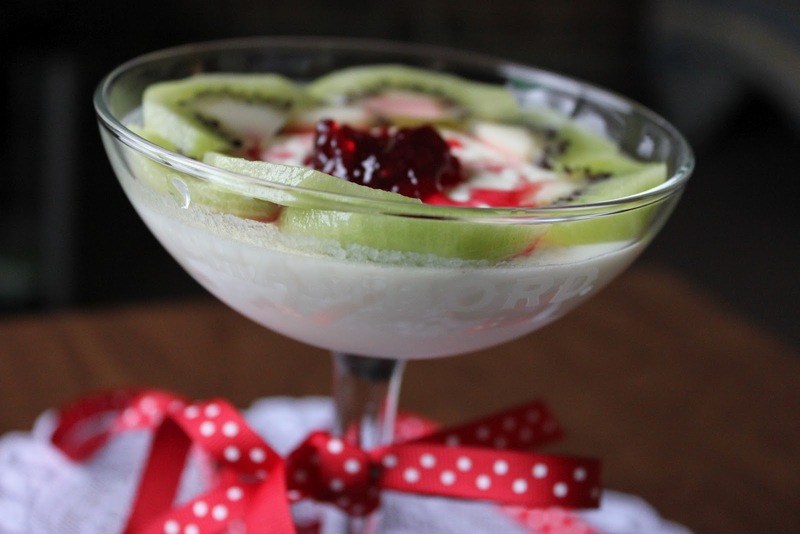 Your panna cotta is stunning! Good menu, and the panna cotta looks really good! Brava! Thank you, Alessandra. You are more expert that I am at it! I wish I could join your V-day table! Love all the dishes, but the panna cotta is my favourite! Lorraine, thank you! Those potatoes are very easy to make. Come back for the recipe. Actually, it's not even a recipe, but a list of ingredients (few) and "how to". That panna cotta looks killer and I love the spinach muffins. Happy after Valentines Day. I agree, love all year! Thank you Suzi, I played with original ingredients for a spinach muffins a bit. It came out very good, I think. Come back for the recipe. Oh, this looks very delicious!!! I am so glad you've found my blog so I could find yours! Wonderful! Thank you Poppy. I like your blog, and hope to come over quite often! I agree with Poppy. I am do glad you found my blog so I could find yours. Your dishes look yummy as well as beautiful! Thank you Sheila. I am glad you like it here. I enjoyed my visit at your blog(s) too. I haven't done any crafts (except in the kitchen) since we moved from Seattle. Maybe I'll get some inspiration from your blog! What a lovely feast, am waiting for the recipe for that potato pancake! Thank you Suchi. I am working on it, although my dental procedure today slows me down. Thanks for visiting me at Stirring the Pot so I could discover your site. I tend to agree with you about Valentine's Day. My kids love the holidays though so I have to indulge them with that. Everything here looks terrific. 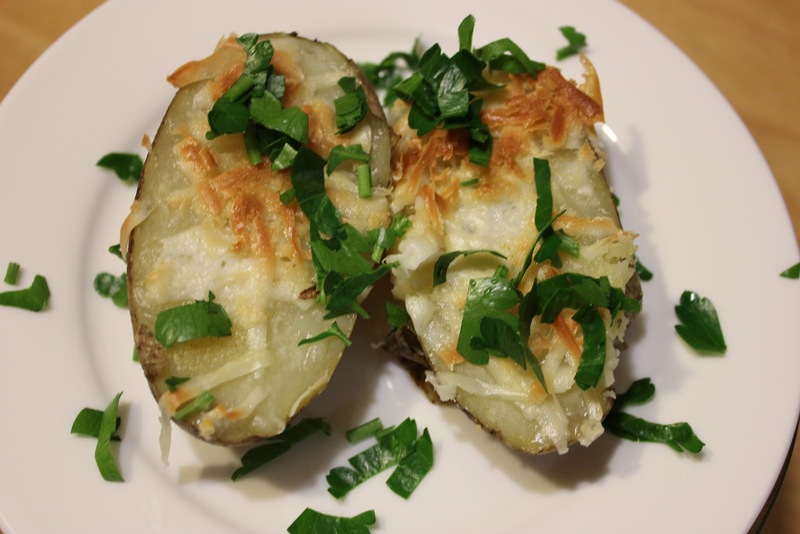 I love the garlic and cheese potatoes - yum! Thank you Kim. I am hungry for some more good food too as all of that is already gone. Wow, what a lovely meal! It all looks so delicious and makes me envious! Thanks for sharing. You have a great blog! Thank you, Priya! I am glad you like it here. I became a member on your blog too, interesting flavors you have there! Thank you Suchi. You are so kind. Ice cream? Let me see if I can eat that, I am real hungry by now. For someone who has mixed feelings about V-day, you sure had a grand dinner celebration! What a feast! Hope you're feeling better. Sucking an ice cube might help some. We do love good food, home made food.